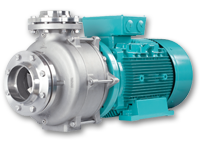 Shanley Pump and Equipment, Inc. stock a complete line of EDUR specialty centrifugal pumps from Germany. 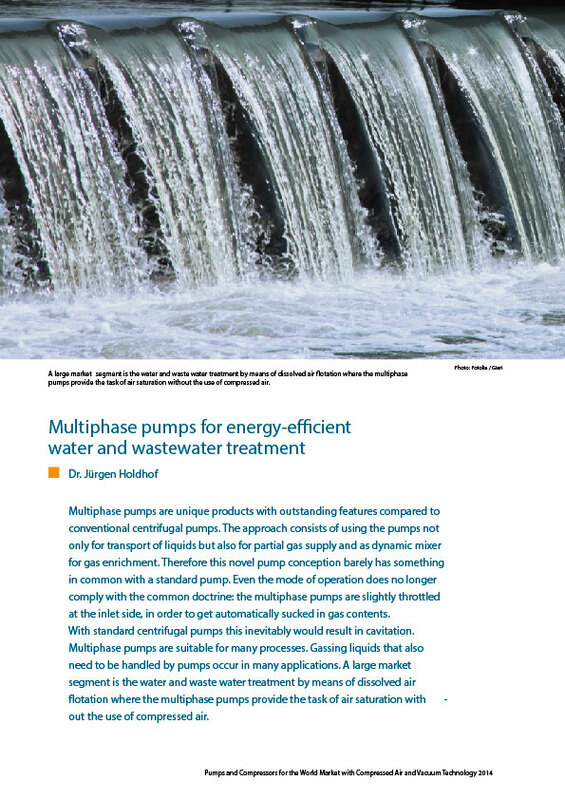 EDUR multiphase centrifugal pumps are designed especially for use in challenging pumping applications such as liquids and gases mixing. Standard centrifugal pumps would fail due to cavitation from Gas-Liquid mixtures destroying the pumps whereas the unique EDUR design allows for this. EDUR Pumps are the standard for European pump design (VDMA24430) and are used in hundreds of applications throughout Europe and the world. 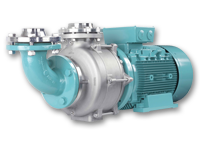 EDUR Pumps also are designed for optimal work in cooling and refrigeration, Recycled Water, Ballast and Bilge Water and Irrigation and Boiler Feed Pumps while other specialized EDUR Centrifugal pumps work with Dissolved Air Flotation (DAF) and Liquid/Gas Mixing. 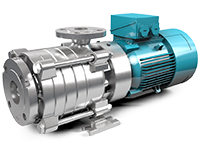 The flexibility of EDUR’s pumps are only surpassed by the quality of manufacturing that goes into each model. All EDUR pumps come from their manufacturing facility in Kiel, Germany where computer assisted design (CAD) as well as fully calibrated quality assurance testing is employed in the manufacturing of each pump made. Each pump is fully tested for optimal operation characteristics before it is released ensuring premium performance. 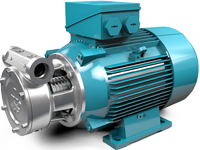 EDUR pumps offer low-wear and steady pumping characteristics for varying operation along with energy efficiency when coupled to the correct motor that can save your facilities the cost of the pump over time! 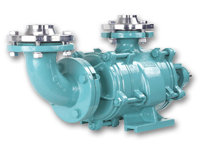 EDUR Pumps come with options such as single or double mechanical seals, closed impeller design, high-pressure working conditions and stainless steel construction materials as well as cast-iron. 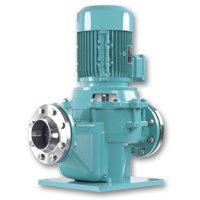 Shanley Pump and Equipment has been the United States representative for EDUR centrifugal pumps for over 15 years. Our sales staff of factory-trained engineers is here to help you find the optimal EDUR brand pump for your pumping application. From Stainless Steel Vertical Inline Centrifugal Pumps to Industrial Self-Priming and High-Pressure Multistage Pumps, let Shanley Pump be your solution and representative to EDUR! 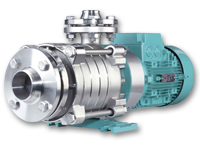 The EDUR NUB single-stage circulation pumps utilizes a compact design with a wide range of designs for clean or slightly polluted liquids. 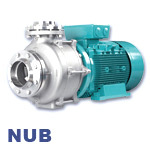 The EDUR NUB line is an all-purpose centrifugal pump for cooling and refrigeration, filtration, air conditioning, etc. and a well utilized design that has served with distinction for decades. The LUB Vertical Inline Centrifugal Cooling Pumps from EDUR set is a Single-stage general centrifugal liquids circulation pump for confined spaces that is the standard for a vertical all-purpose single-stage general purpose circulation pump for general application usage for clear or slightly polluted liquids. 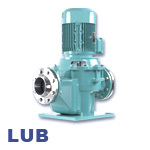 The LUB Series space-saving design makes it a desired pump for limited space areas where the pump “footprint” is at a premium. The EDUR BC Stainless Steel Centrifugal Process Pump for cooling, refrigeration, filtration, shipbuilding etc. are all-purpose standard circulation pumps for clear or slightly polluted liquid mediums with a wide range of applications. 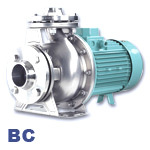 The EDUR BC Pumps design allows it to fit easily into the standard footprint of a more traditional stainless steel centrifugal pump. 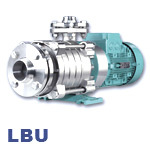 The EDUR LBU High-Pressure Multistage Centrifugal Booster Pump is a compact multi-stage design for booster systems, irrigation, and boiler feed that uses a traditional horizontal multistage design of multiple impellers in a segmented pump design on a central shaft to increase flow and pressure. 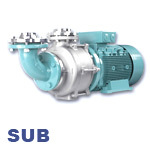 The EDUR SUB Self-Priming Centrifugal Pumps are all-purpose single stage heavy-duty circulation pumps for clear or slightly polluted liquids with a wide range of industrial pumping applications. The EDUR SUB Pumps design allows it to fit easily into the standard footprint of a more traditional Self-Priming Centrifugal pump. The SUB series is designed with a standard open impeller design without axial thrust or in a balanced closed-impeller design. The EDUR SUB operates at pressures up to 145 PSI at an operational temperature range of -40°F to +194°F with a Viscosity of 115 mm2/s with a series maximum flow rate of 704 GPM. The EDUR PBU Liquid-Gas Enrichment and Ozone Mixing Pump is a centrifugal multiphase DAF process pump. 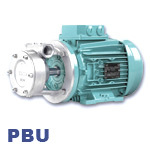 The PBU’s ability to reliably process and pump without cavitation entrained gases in liquids with contents of up to 30% and its high energy-efficiency and its technical superiority with the ability to replace many pumping components into a single unit the PBU Series is truly a leader in the field. The PBU’s ability to generate stable micro bubbles to supersaturate a system is what sets it apart. 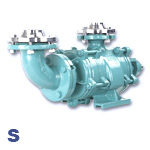 The EDUR S Self-Priming Centrifugal Pump for Clear and slightly polluted liquids such as Water Supply, Booster Systems, Irrigation and Dewatering systems is an energy efficient centrifugal pump with optimised head per stage and a low velocity of flow. The design characteristics of the S Series allow for a Gas-Liquid mixture to be safely pumped without cavitation. This is achieved by the S Series by having a unique design that allows for either open or closed impellers in a uniquely designed casing. The EDUR CB Stainless Steel Centrifugal Cooling and Refrigeration Pumps are all-purpose single stage standard circulation pumps for clear or slightly polluted liquid mediums with a wide range of applications. 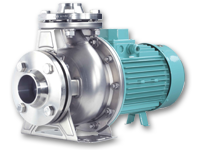 The EDUR CB Pumps design allows it to fit easily into the standard footprint of a more traditional stainless steel centrifugal pump. The EDUR CBF Compact Stainless Steel Centrifugal Vortex pump is an all-purpose single stage standard circulation pump for clear or slightly polluted liquid mediums with entrained solids or suspensions with a wide range of industrial applications. 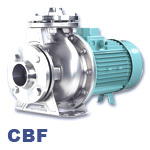 The EDUR CBF Pumps design allows it to fit easily into the standard footprint of a more traditional centrifugal pump. 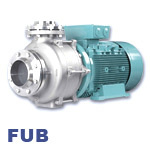 The EDUR CBF Series operates at pressures up to 145 PSI at a temperature range of -4°F to +230°F with a Viscosity of 60mm2/s with a series maximum flow rate of 264 GPM and an operating pressure of up to 145 PSI. The EDUR FUB Compact Centrifugal Vortex Torque-Flow Pumps utilize a revolutionary design that relies on the impeller creating a vortex similar to a tornado that creates the pump suction allowing for liquids with solids content up to 15% to be easily pumped. The EDUR VBU High-Pressure Vertical Multistage Pump uses multiple impellers in a segmented pump design on a central shaft to increase flow and pressure for a wide variety of application industries such as booster systems, irrigation, boiler feed and water treatment and washing plants. 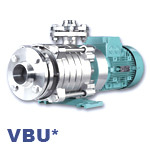 The VBU Series is a professional’s choice for the pumping of clean and slightly polluted liquids. *(Picture Displayed is not VBU Model).